L'interface d'acquisition basé sur le pic18F252 est relié via l'Xport à la console Freebox par cable liaison ethernet. La freebox sert de server de donnees. 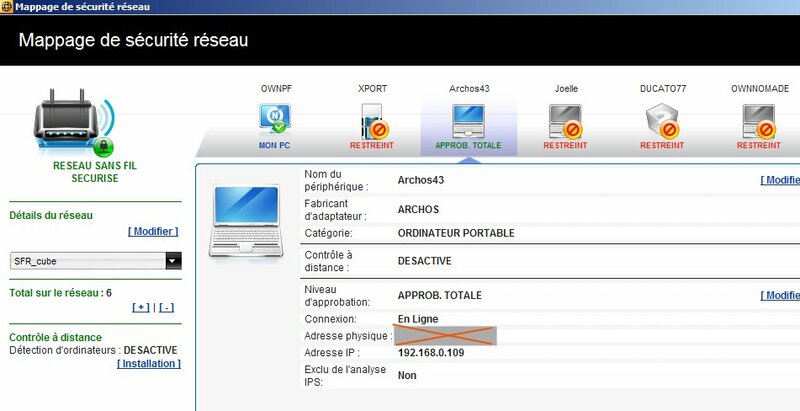 L'archos est connecté en WIFI au reseau Freebox. 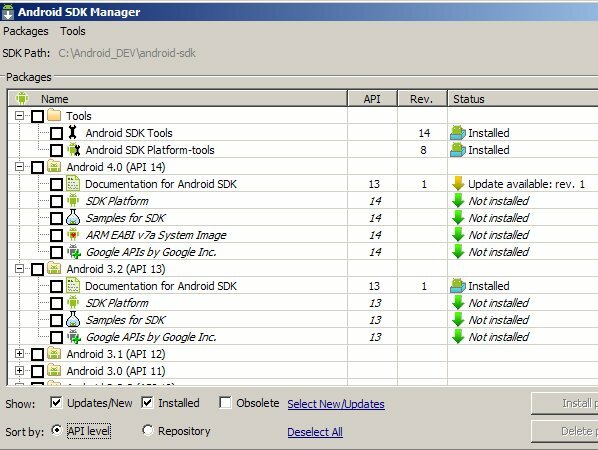 Reste à developper un interface utilisateur Android !! 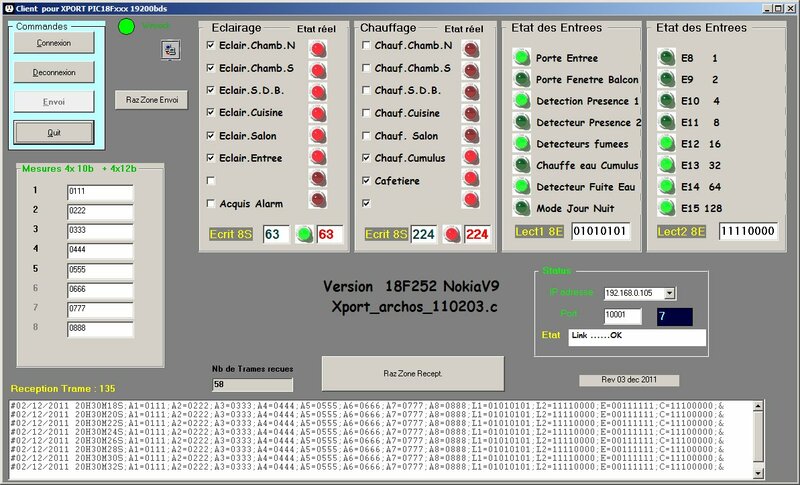 avec quel environnement et logiciel de programmation ? prise en main super easy , c'est du basic ! 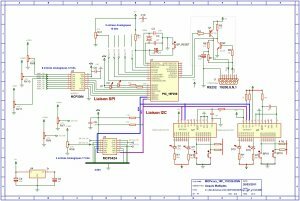 outil interessant, à voir si ce Basic peut permettre de récupérer le flux d'une socket ? 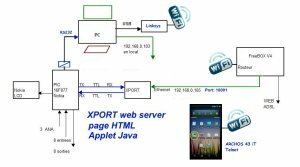 recoit les datas du XPORT ! 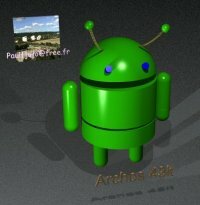 le simulateur ARCHOS demande beaucoup de ressources ..ce PC PIV 2,6Ghz rame un peu..
avec la meme config IP et Port. 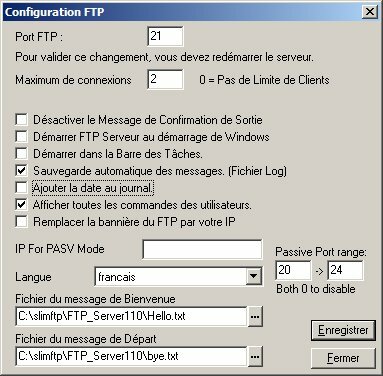 le transfert de fichier est alors tres aisé, en commutant les taches Basic et AndFTP sur l'archos. Les TESTS SONT ALORS REELS. 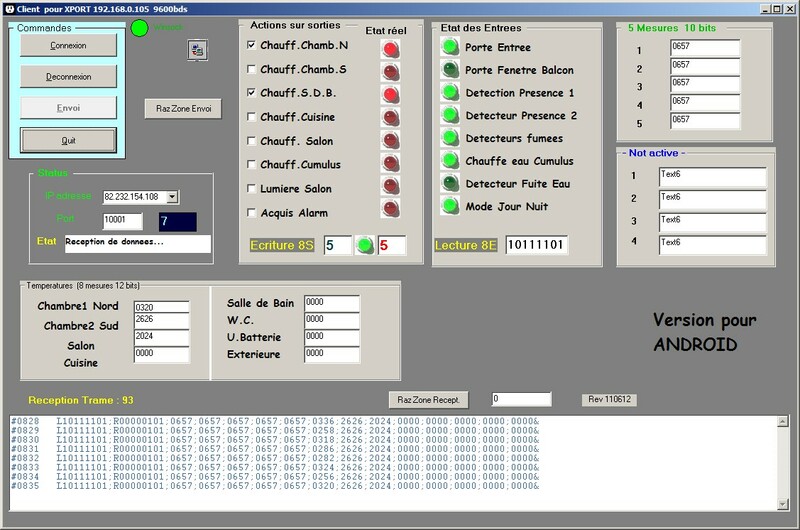 de temperature des pieces en cliquant sur le RadioButton correspondant pour la selection d'1 voie parmi 4. La Trame recue via la socket est affichée en bas de l'ecran. Tous les champs sont separes par un ";"
Un indice , incremental, est affiche en haut à gauche . La date et heure est celle de l'application distante a Microcontroleur. Rafraichissement toutes les 2 secondes avec usage de la sockett. Bug : Pas d'ecriture possible vers le PIC18F..
Pour faciliter la mise au point , un drapeau Test=1 permet de commuter une trame fixe de données, remplacant celle de la socket. et rendre independant le developpement coté µcontroler . 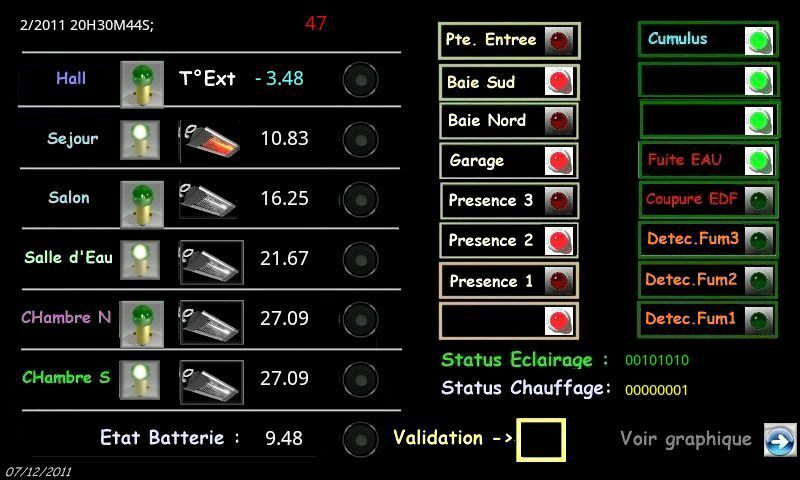 l'Appli basic est testable en autonome vu que la trame est simulee par l'appli basic. L'appli s'arrete apres 1H00 d'usage continu ! 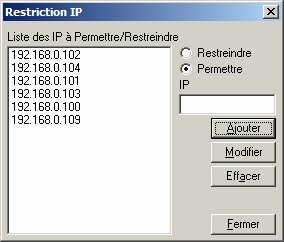 -Essai de la version bBasic corrigée : le probleme est du à la transmission de caractere au format UNICODE sur 16 bits. - ladite commande s'affiche sur le Nokia en dessous de "Commande recue" ! - il semblerait que les epaisseurs d'ecriture varient en fonction de la couleur choisie ? ou est-du à la resolution de l'ecran ? Test multiple pour la validité de la liaison : Tests sur Date/heure , etat secondes comme Byte de vie. 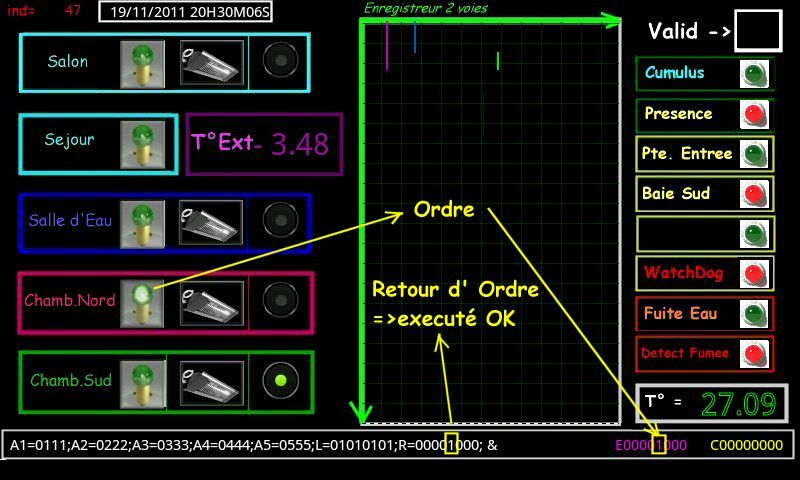 Cette toute derniere (au 16/12/2011) version résoud les problemes rencontres avec la socket. 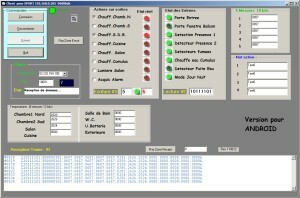 avec la fonction socket.client.write.bytes chr$(13) pour valider l'envoi des commmandes. 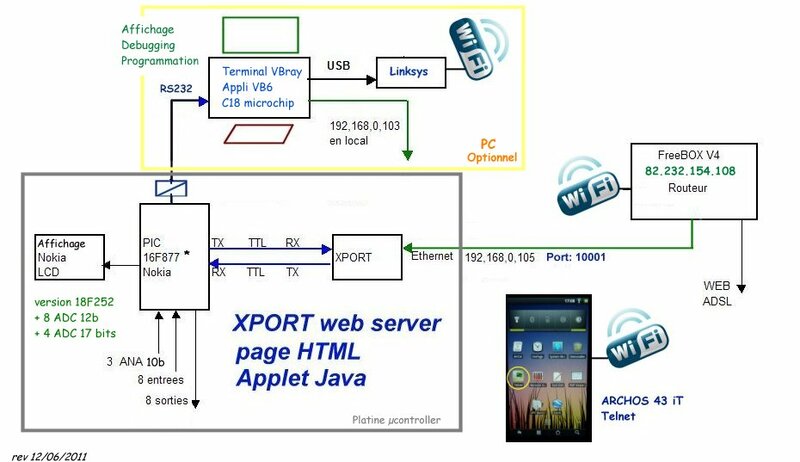 Summary of this application : It is a Home drive application An Archos43it is used as Graphic User Interface to pass commands for Lights or Heater in an appartment or House, using Wifi link. 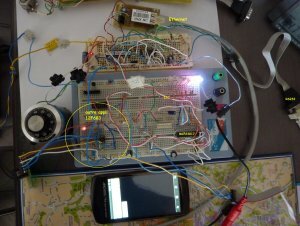 The heart of the systeme is a microcontroler PIC18F252 and hardwares interfaces to drive the devices, to do analogues measurements (ie rooms Temparatures , external Temp..) and send all data to Ethernet (or internet) via an Lantronix XPORT-03 interface (convert RS232 TTL into Ethernet flow). Ethernet link is connected to my Freebox (witch act as a router). 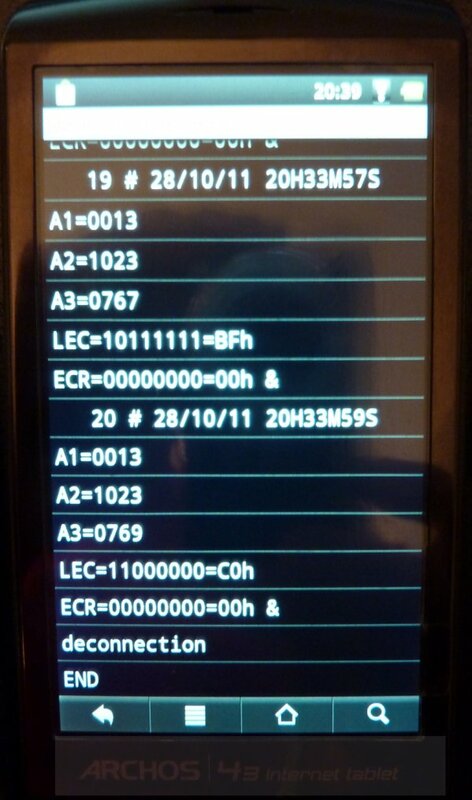 So with the "socket functions" , Archos can receive all the datas. 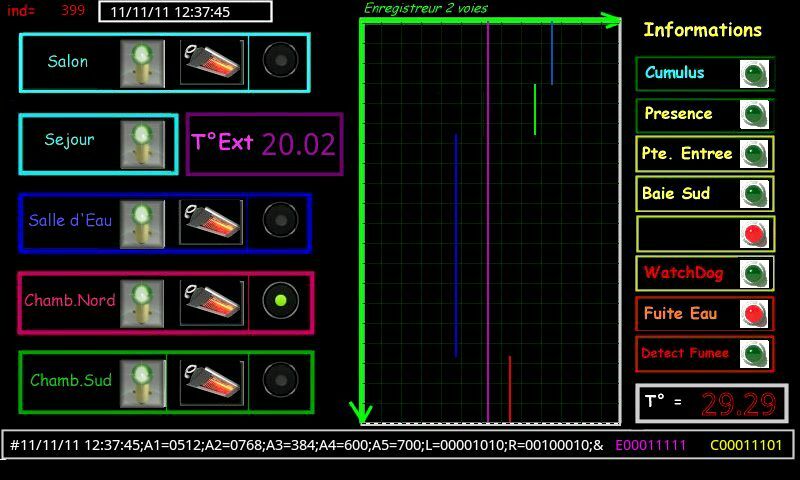 And send (now only with bBasic.0137.apk) order to drive (up to 9) lights and (up to 7)Heaters. 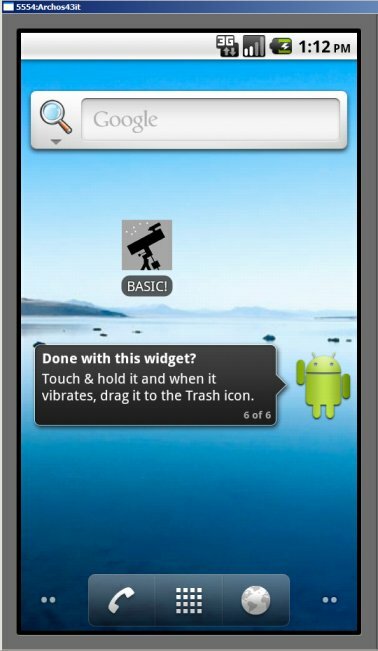 A feed back of all the commands can be show on Archos. A fixe image as background : Arrplan_b.jpg to locate the external devices to drive. - some Lamp to do ON/OFF LIGHT command by touching the Lamp - some Radiator to do ON/OFF Heater command by touching the radiator After chhosing ON or OFF commands , uou must click into Validation rectangle to send the commnands to the interface 8 analog measurments ( 4 measures ADC 10 bits + 4 measures ADC 12 bits) - 6 Analog for room temperatures measures , One is allways External Amb Temp , - 1 is the power safe Battery voltage. 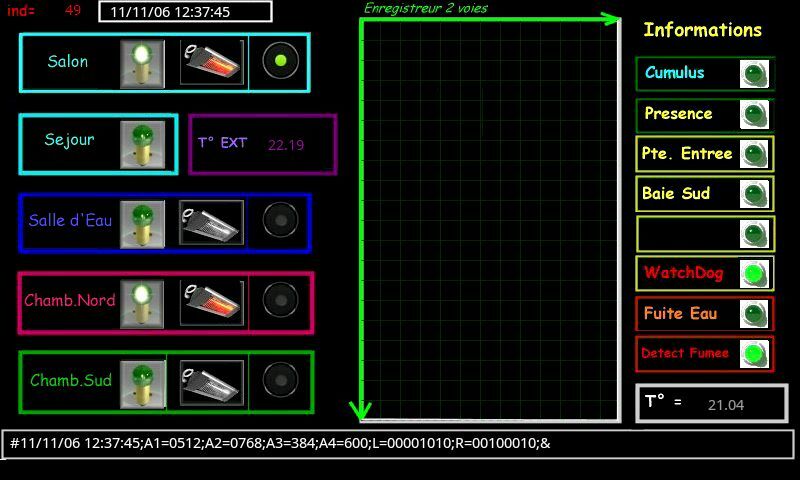 - 1 as spare not indicated 16 inputs are retrived , for general information (status of door) or reports alarms (smoke detector) - status of 8 inputs with green leds - status of 8 others inputs with red leds Now no treatment linked with these inputs... At the top left of the diplay, the beginning of the received trame by the socket : -Date and time of external device (18F252) and an index value that indicates the number of received trame. 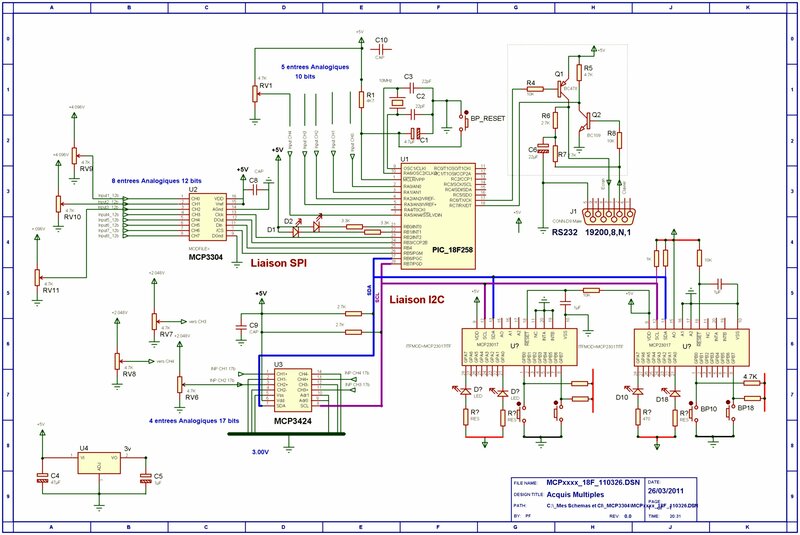 This 2 values indicates that the interface PIC18F252 is running and Basic is running. If no data are comming within 4 secondes, application stop with "Timeout Message." At the startup (power on of the PIC interface, Status indcates 12345678 = abnormal value) So, in this case, you have to refresh all commands on Archos .. At the right bottom of screen are the 2 feedback values (Status of Light and Status of Heaters) The treatment of discordance between Order and Feeback (status) is not yet implemented. Now the Commands ( Socket.client.write.line EE$) only works with versus bBasic-0137. not yet full implemented: Choose on of 7 other by pointing the Round selector for reccording. The 2 choosen Analog are recorded on grafic (RAZ every 400 measures, no file to save value at this moment ) This is a study versus to understand the data exchange. 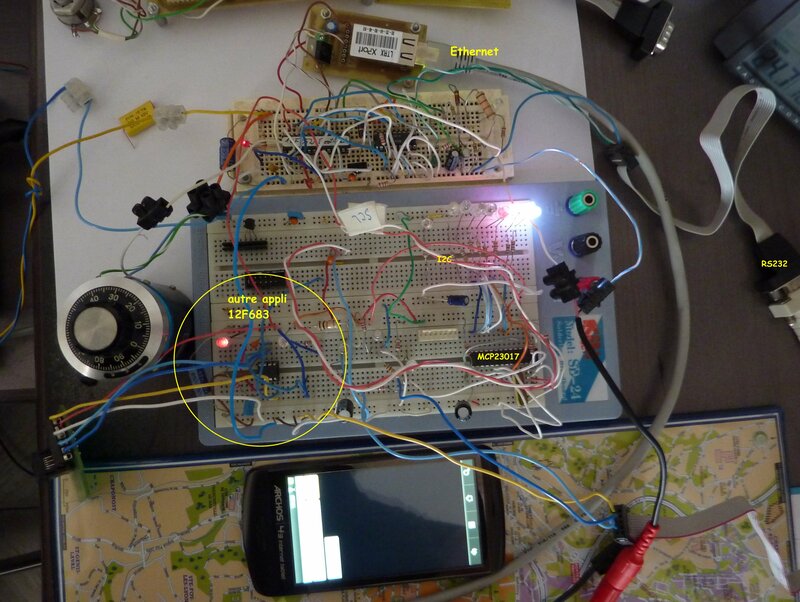 A flag test=1 permit to run the basic programme without external PIC18F device. 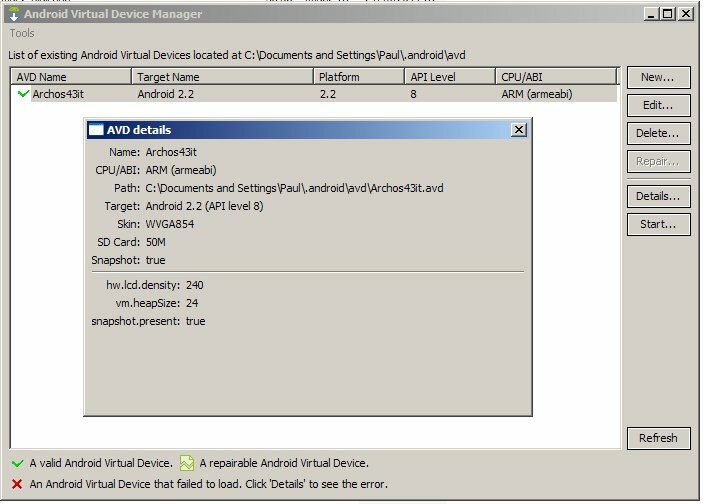 There is a NbMax value in the basic programme to stop application. 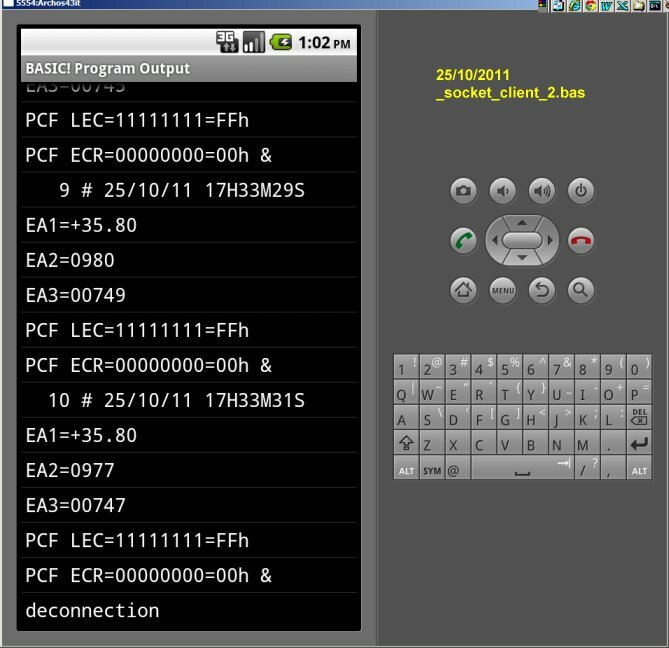 Nota: Even you stop Archos basic application, PIC18F252 continue to works , because is a stand alone application, not connected to a PC computer ! A screen capture is made juste before the last cycle. (so NbMax-1) A console.txt resumes what append during the execution of this program you can validate the debug.on in the begining of source. Now the programme cycle is a bit too long..more than 2,5 sec i have to improve it, because on PIC18F side, cycle can be less or equal to 1 seconde. I know java is more efficient, but more complicated for a novice as me. I will add later , a help file .. So i will add many other improvment , only if y can succeed with data writing with next versus of basic 01.39. if you have some idea , you are welcome to participate. You can find details about PIC18F application (in C18 mplab) on my web page. Sorry for my bad English.